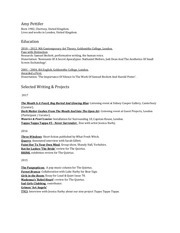 This PDF 1.7 document has been generated by QuarkXPress(R) 7.3, and has been sent on pdf-archive.com on 08/06/2011 at 21:50, from IP address 66.27.x.x. The current document download page has been viewed 911 times. File size: 809 KB (16 pages). Arts Museum Houston, July 15, 2010–September 26, 2010. Karol Kreymer and Robert J. Card, M.D. generosity of the Museum’s trustees, patrons, members, and donors. 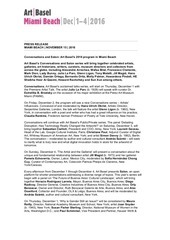 Commission on the Arts, and the Wortham Foundation. cameraless or direct film techniques. in the creation of her films. reverent nostalgia, West extends them through reinvention. including food, drinks, and even the site itself. than a four-foot-wide square to images of ten to fifteen feet wide. in running time, the artist often cycles them in a continuous loop. These site-specific presentations appear either as a single projection installation or in an installation composed of multiple projections. other recreational pursuits—all worth briefly mentioning. of the film’s protagonists, who engage in acts of compulsive eating. pickles, eggs, milk and other food residuals of the Maries’ feast. toward feminist ideology in film. of flowers, spray paint, nail polish, and air freshener. in the late 1960s, but was widely banned as a legitimate sport. well as to infer the passage of time and shifts in the moon’s cycle. mirrors and Mylar to imprint the emulsion. det=ok&amp;title=Jennifer-West (accessed August 15, 2010). Wilson, An Art Exhibition, Tate St. Smoke, Mirrors, Darts, and Lavender Mist. conjunction with performance and exhibition Shred the Gnar Full Moon Noir. Aspen, Colo.: Aspen Art Museum, 2010.
at Art Basel Statements 30, Switzerland. London: Vilma Gold Gallery, 2008. Jwest). New York: White Columns, 2007. Iversen, Margaret. Chance. P. 219. Cambridge, Mass. : MIT Press, 2010. Kaleidoscope (Summer 2009): pp. 30–33. 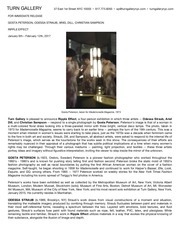 Marc Foxx.” Artforum (May 2009). &amp;id=21934 (accessed August 16, 2010). 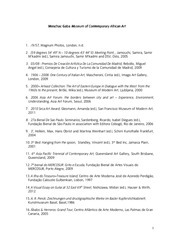 Museum of Contemporary Art, 2009.
n (accessed August 16, 2010). Frieze, no. 113 (March 2008). Cotton, Michelle. 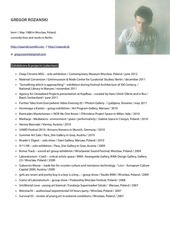 “The Source.” In Psychonauten Kunst in Ekstase / Art in Ecstasy. Frieze, no. 109 (September 2007). Deep.” Guardian, May 29, 2007, p. 23. Everybody Had An Ocean. Exh. cat. Cornwall, England: Tate St Ives, 2007. Stranger, September 1, 2005, p. 45. Weekly, August 31, 2005, p. 35. Videos Are Terrific.” Seattle PostIntelligencer, May 12, 2003, p. F1. August 27, 2002, p. D4. The Stranger, August 8–14, 2002, p. 54. Weekly, August 7–14, 2002, p. 46. 30–June 5, 2002, p. 45. Stranger, December 6–12, 2001, p. 55. October 23, 2001, p. E1. Times, October 19, 2001, p. 44. This file has been shared by a user of PDF Archive. Document ID: 00031321.